Graphite. Signed and dated lower left: Ingres/1830. 269 x 212 mm; 10 ½ x 8 3/8 in. Private collection, France, purchased in the early 20th Century, then by descent. The sitter in this portrait is identified by an inscription on the old frame, la Marquise de Beaumont and portrays a certain Anne Armande Antoinette Hue de Miromesnil (1766 – 1830), wife of the Marquis André de Beaumont (1761 -1838), who inherited the title from his father, Anne-Claude de Beaumont. The drawing was made in the year that she died. The portrait has much in common with others realised by Ingres at this time, for example, that of Madame Jean-Baptiste Lepère in the Musée du Louvre, Paris, again dated 1830, that of Madame Chantal Marcotte, in a private collection, dated 18342 and another, as here, previously unpublished portrait, of Madame Godinot, her hair similarly dressed, from 18293. In the present work, the Marquise is dressed with great care, with puffed sleeves and a frilly indoor day cap and bonnet. The belt and hat are of a similar design to those depicted in the portrait of Madame Ingres in the Musée Ingres, Montauban, dated 18354. 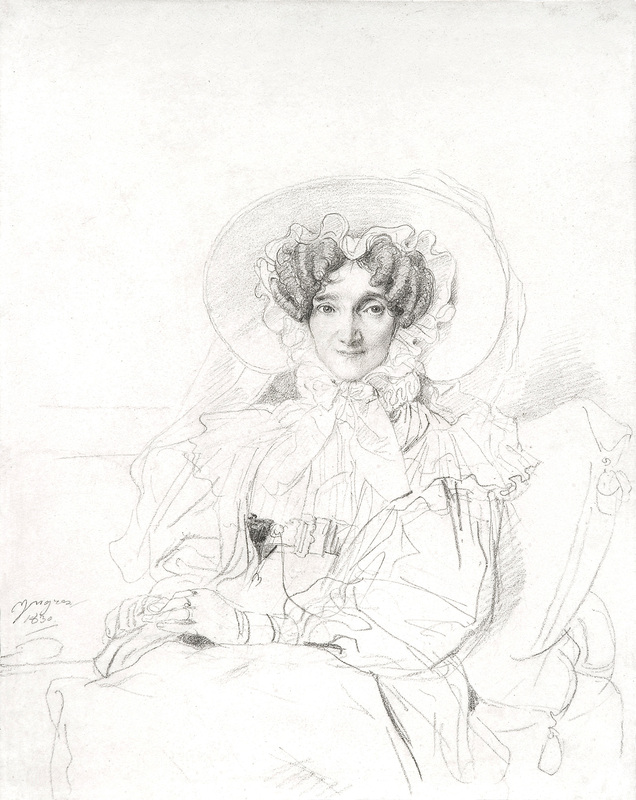 As with many of Ingres’s portrait drawings, it is the face which is the true focus of his attention; here the folds, pleats and tucks of the Marquise’s voluminous dress are described rapidly in long, curving lines while her elaborately curled hair and fine features are defined with subtle and precise modelling, the expression – a slight smile and thoughtful eyes - is defined with great sensitivity. The Marquise sits against pillows, her hands gently clasped and perhaps the deep-set eyes and thin face, delicate against the huge bonnet, are signs of her fading health. These years were significant for being a period in which Ingres’s reputation was particularly high for portraiture; those he exhibited at the Salon were generally very well received, although sometimes controversial; for example his 1832 portrait of Louis-François Bertin, now in the Louvre, greatly affected people with its realism but numerous critics deplored it5. Ingres himself regarded portraiture as a ‘cursed’6 activity, ‘Maudits portraits!’4, taking away precious time from history painting but the portrait drawings, which served the purpose of earning him a living, are now arguably his most loved works, and in the words of Hans Naef, ‘one of the most glorious chapters in his career’. Letter written in 1807, see H. Lapauze, Le Roman d’amour de M. Ingres, Paris, 1910, pp.170-171. See Hans Naef, Die Bildniszeichnungen von J.-A.-D. Ingres, vol. V, Bern 1977, cat.337 and 348. See exhibition catalogue, Portraits by Ingres, Image of an Epoch, London and New York, 1999-2000, cat.106. See Hans Naef, op. cit., cat 363. See exhibition catalogue, op. cit., 1999-2000, p.304. See exhibition catalogue, op. cit., 1999-2000, p.423, note.16. See Hans Naef, ‘Ingres' Portrait Drawings of English Sitters in Rome’ The Burlington Magazine, Vol. 98, No. 645 (Dec., 1956), p.427.